Recently, the MPA International Connection hosted a potluck where international students shared foods from their respective home countries. Fortunately, they invited all of us to come and try them out. 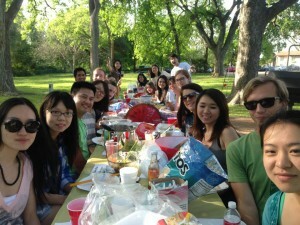 In good spirit, the domestic students brought some of their own food to share with the international students. Career Consultant Dawn Shaw was there, too, helping promote unity among the varied group of students in the MPA program. About 25 students brought food from China, Philippines, Korea, Vietnam, Mexico, Hawaii, and elsewhere. My only regret is that I didn’t save more room for the Korean BBQ. A bigger sampling might have given me enough ammo to write about another stop on my “BBQ trail” even though it’s pretty different from Texas BBQ. There was so much food that I didn’t get to eat a substantial amount of any one dish, but I do not regret taking the opportunity to try out each one. My contribution, being a southerner, wassouthern-style sweet tea. I made a regular sweet tea version and another one infused with fruit. Altogether, it was a great way to branch out and try something new that you would not otherwise be exposed to. I have always enjoyed eating foreign foods, but there’s nothing like home-cooking. That is a truism that transcends national and cultural boundaries. It also provided a venue to better get to know some fellow students who we may not have known at all otherwise. That there is enough interest in an event like this is a testament to the diversity of the Texas MPA class, which is a quality important to me. I have enjoyed my travels outside the US and look forward to future travels, but experiencing fellowship in this context with others who are outside their home countries is the next best thing. “A good judge is better than an unbiased one”…? Russian judge Shekhovtseva hugging Russian gold medalist… demonstration of independence? In case you couldn’t tell by the number of figure skating posts I have written earlier, I follow the sport very closely as a judge. At this year’s Sochi Olympics, the Ladies Free Skating event was filled with public backlash and drama. This is because reigning Olympic champion, Yuna Kim (or Queen Yuna as some of us like to call her) skated two flawless programs and won this year’s silver medal, missing the gold by a large margin to Russian teenager Adelina Sotnikova. Fueling the outrage was the apparent lack of independence of the judges and officials of the event, most notably Alla Shekhovtseva of Russia and Yuri Blakov of Ukraine. The former judge is married to the head of the Russian figure skating organization and was the judge seen and photographed hugging the gold medal winner moments after the competition. The latter was formally suspended for trying to fix a result during the 1998 Olympics and allegedly has ties to Moscow. The Korean Olympic Committee has decided this week to file a complaint to the International Skating Union about an alleged breach of the code of ethics during the ladies competition. The KOC and Korean Skating Union are asking for a thorough investigation for the judging composition and whether it was biased toward Russian gold medalist Sotnikova. 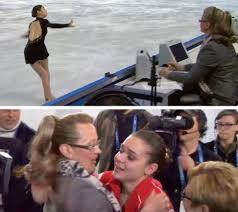 The term “family” as used in this Rule shall be understood as including all persons, who, due to their relationships, may reasonably appear to be in a conflict of interest position regarding a competing Skater, ineligible person or remunerated Coach. It could be argued that marital ties to the Russian skating federation falls under this definition, calling into question her independence. As we all know and can appreciate as accountants, independence is one of the core principles of auditing. A statement attesting to the validity of a company’s financial statements means nothing without some reasonable level of independence. Part of the reason this scandal fascinates me so much is how important the concept of independence can be seen (and ignored apparently) in so many areas of the world, most notably in sports. Ummm…what? The auditor training in me is cringing. Imagine if a corporation said this about it’s auditors? To even become entry-level staff on an audit engagement requires a masters degree and a CPA certification, meaning that there will not be any idiots touching your financial statements. Without independence and people believing your attestation is valid and unbiased, there’s no point. It can’t be relied on. A couple of months ago, we all received an invitation to compete in BASF’s Team Chemistry challenge. A fellow MPA student decided to form a group, and so I joined. It seemed like a fun project – come up with ideas to lessen the environmental impact of football gameday. 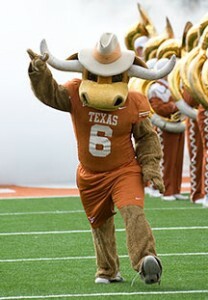 I love football gameday and I have an interest in environmental sustainability, so it was like a match made in heaven. Of course, the incentive of winning a bunch of money didn’t hurt. So, we set to work coming up with ideas on how to approach the problem. We easily came up with a host of small solutions that would have some impact, but quickly got bogged down in the details. After spending some more time pondering our work, we decided to focus on a group of related solutions and hone in on them. As Joel said in his most recent article about accountants being risk-averse, we learned from our initial mistakes, found the proper balance, and ended up with some pretty cool ideas. We were invited to a couple of events by BASF and the Athletic Department to learn more about the initiative and the goals of the competition. One event was a sustainability panel sponsored by UT Engineers for a Sustainable World. The panel was entirely made up of engineers and the audience was entirely engineers … except two of us MPA students. It was very intimidating hearing about them discussing various polymers of which we had no clue of their existence much less their properties. Apparently these students have a big advantage over us with their knowledge of chemicals, considering BASF is essentially a chemical company. The next event was a stadium tour, during which our guides told us about their issues with waste management. Their focus seemed to be only on waste management problems, while our solutions did little to address that. But, we pressed on, confident in the power of our ideas despite not having the technical knowledge that is certainly common among our competition. What we do have is a business ingenuity that enabled us to come up with feasible solutions that are easily implemented and have a measurable impact. We used the skills we have learned in economics, finance, and accounting to estimate the results of our proposals. We also used our branding and presentation skills to develop a persuasive format through which to deliver our proposal. We find out Friday if we are invited to the finalist round, where we will present and defend our ideas in a “shark tank” environment. We’ve had fun putting it all together, and we’re proud of our accomplishments, but it would be great to get to write a “Part II” to this article about our preparation for the finalist round! In late February, Program Director Jim Franklin and Department Chair Lillian Mills were able to have some members of the Institute of Chartered Accountants of England and Whales (ICAEW), one of the leading institutions publishing articles about the profession internationally, to come and speak about the future of global auditing with members of MPA Council. Let’s say we are on the small island described above. There is no need for audited financial statements because there is trust between the companies and shareholders. We face the decision of requiring audited financial statements in the face of foreign companies wanting to sell shares on our island because we do not have the same trust in these companies. Auditors would become in demand because of a lack of trust between company management and investors. If shareholders feel they have been presented fraudulent financial statements, they will blame the auditors for not catching it. Even though it was the company that committed the fraud, the highly-trained auditors did everything they were supposed to do, a disproportional amount of blame falls upon the auditors. This blame falls on the auditors because most people don’t fully understand the role of the auditors and the work they do. They just expect them to catch all and any fraud. This is what we discuss in auditing class as the expectations gap. Because people don’t understand the training and qualifications we have, and the limited nature of our job, we can only do so much to prevent fraud. Companies preparing the financial statements are the ones ultimately responsible. Also, auditors are held accountable for the effectiveness of accounting standards. The problem with this is that the world is coming more and more complex, and companies are quickly adapting their operations in order to survive in the complex world. Frequently, we can’t keep up in developing accounting standards to reflect these new and innovative ways of doing business. Technically, a company’s financial statements could be following GAAP, but the core economics of the transactions are misrepresented. The answer seems to be to close the expectations gap and to increase people’s trust in our services. The million dollar question, though, is how in the world can we do that? All I can say so far about being a 5th-year MPA in her final spring semester is that studying for the CPA is hard. All I think about is accounting, which can start to take a toll on your sanity. In an effort to make light of a somewhat overwhelming situation, I am attempting a number of techniques to make studying more fun. 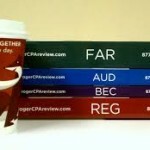 The first one of which is to try a technique one of my previously graduated friends has pioneered: CPA-related poetry. This isn’t so much a blog post as me sharing the various modifications of famous poems to reflect the joy of CPA studying. I plan on posting other posts that will document the other techniques to make CPA studying more fun and enjoyable. 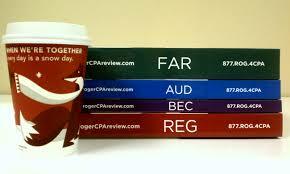 I hold with those who favor CPA. What’s life as a Texas MPA all about? 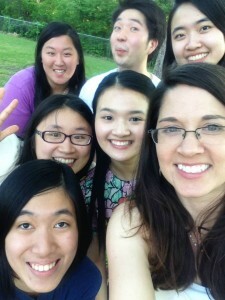 Current students give you the inside scoop in their blogs. 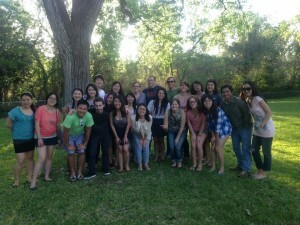 Read up on their perspectives on classes, the job search, living in Austin and more.